We all know that the United States Postal Service is having some financial difficulties thanks to the Technological Revolution of the past 15 years of so. Starting this summer, they won’t be delivering mail on Saturdays anymore and postage prices keep going up. I noticed something while I was shopping for some March birthday cards at Wal-Mart this past weekend [spoiler alert, Katelyn, Grandpa, Clif, and Christie, you’re getting birthday cards from me]. 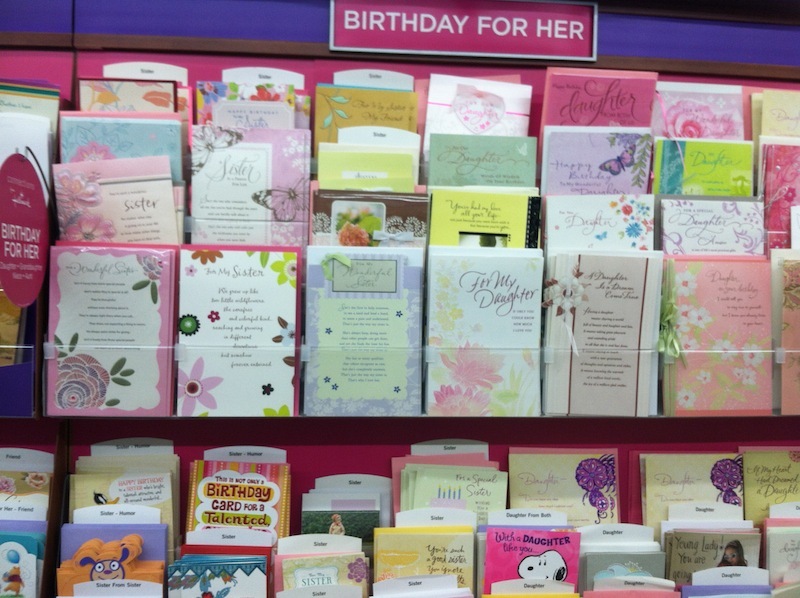 So if you look at the picture – and I’m not sure if you can tell or not, but the birthday cards on the top row are all really large while the ones on the bottom row are normal birthday card size. There was a much larger selection of the extra-large cards. Coincidentally, all of these XL cards had the little “Extra Postage May Be Required” notice where the stamp went.